It can be an exciting or terrifying experience - buying your first scubadiving gear. When you first walk into the Aladdin's cave just groaning with the latest dive technology, your question is likely to be "Where do I possibly start?" The answer is quite simple. Choose your dive centre very carefully - then, if you enjoyed your scubadiving course, trust them to outfit you with the best dive gear for your type of diving. When you select your dive centre start by establishing the credentials of it. Generally, the more status the dive centre has, the more it has been audited for quality and customer service. 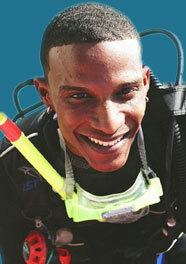 If possible, choose a PADI 5 Star Career Development Centre. Failing that, try a PADI 5 Star Instructor Development Centre and so on down the retail status list. Other training agencies have similar ratings. Word of mouth is another very strong indicator as most people tell others about a bad experience. After you have completed your course, unless you are totally focused and do it beforehand, you will want to buy your our scubadiving gear. There are literally thousands of different dive items on the market and each scuba retailer offers a selective few brands. Normally these equipment lines are complementary so that the dive centre should be able to satisfy novice or experienced recreational divers through to highly experienced technical divers. If you are about to buy your own scuba gear take time to read our advice. Probably the most critical dive equipment is the regulator and buoyancy control device BCD combination. The regulator should be selected on performance and reliability, that is ease of breathing at the depths you intend to dive to. Do a careful price comparison if your budget is critical. Your scuba dive centre retailer will guide you here. A BCD must be comfortable but most importantly it must be able to lift your face clear of the water at the surface. The inflator mechanism must be easy and fast to operate. Check the lift of a BCD before you start loading the integrated weight system up with lead weight. While it may lift you wearing a wetsuit, it may be overloaded once you take it off to pass it (with any integrated weight & cylinder) into the boat. Recreational BCDs are not designed for technical diving and should not be used for that purpose. You will need to consider your instruments as well. Whatever your financial position you will need a submersible pressure gauge (SPG) and compass. It may be cheaper to purchase a dive computer rather than a depth gauge and timer / underwater watch. Dive computers show dive and surface interval details as well as guiding your ascent speed. Some give integrated information on nitrogen absorption and gas consumption. With a computer it is easy to retrieve dive information so you can log your dive.There are also Nitrox computers for sport divers and multiple gas computers for tech divers. Get your dive instruments in a console for easy reference. For regulators BCDs and instruments, check the warrantee. If you intend to travel, it should be worldwide. Some offer lifetime warrantees for parts. Beware buying product over the Internet, as there may be no warrantee. In many countries, scuba dealers will not honour internet warrantees, as the product was not bought through a licenced dealer and ownership is hard to authenticate. You will want to stay warm and may only need a shorty wetsuit in the tropics. As you move further away from the equator, you might need a full length 5mm or 7mm wetsuit or even a drysuit. Try to buy the best you can afford as you will not enjoy even the most spectacular dive if you are trying to stay warm. Night diving is fantastic - only if you are warm. Comfort and fit are critical. When you select your dive mask try every one on display. Ssniff in hard and listen for air leaks to ensure an exact fit. Additionally, press the mask in over your nose and brow to ensure there is no contact. Some mask lenses can be changed for prescription lenses. If you wear glasses ask your scuba dealer which ones will take prescription lenses. Identify the dive masks that fit then try those few again. When you get to the best two, choose the cheaper one. If your mask does not fit well, you will not enjoy your scuba diving. Resist the temptation to buy a cheap snorkel. You need a good one so you can breathe on the surface face down. Accept the dive centre retailer's advice. Fins are your propellers. Get fins that fit your feet properly, without placing pressure on your toes or the bridge of your foot. Always wear your own dive booties when trying on fins. Split fin technology is state-of-the-art now and worth every cent. Try for a soft or medium flex fin. If you want to be a technical diver, select firmer split fins. Get spring straps if your retailer has them. You will need weight unless you are negatively buoyant at the surface. When you purchase your BCD, consider one that allows you to carry weight in the BCD weight pockets rather than around your waist. Many women do get minor bruising on the hips through wearing heavy weight belts. With a drysuit you will generally need more weight than you would with a wetsuit. Contoured weights are preferable to slab weights. You are now set to have fantastic scubadiving adventures. Enjoy the freedom of gliding in the ocean current along coral encrusted walls, through underwater canyons, exploring timeless shipwrecks or absorbing the stillness and tranquillity of a freshwater lake. Wherever you are, you will enjoy your scuba diving if you are confidant that you have chosen your scubadiving gear wisely. ©Copyright 2019 Equinoxe-aqua.com. All rights reserved.